محمدعلیها, محمدرضا, موسوی, عاطفه, مهری خوانساری, نبی, صفرآبادی, مجید. (1394). بررسی تاثیر نانوذرات هیدروکسی آپاتیت و آلومینا بر رفتار چقرمگی شکست کامپوزیت‌های دندانی و استخوانی پایه پلیمری. 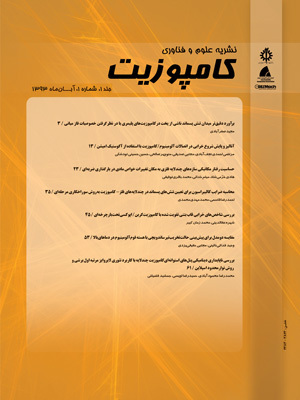 علوم و فناوری کامپوزیت, 2(2), 9-16. محمدرضا محمدعلیها; عاطفه موسوی; نبی مهری خوانساری; مجید صفرآبادی. "بررسی تاثیر نانوذرات هیدروکسی آپاتیت و آلومینا بر رفتار چقرمگی شکست کامپوزیت‌های دندانی و استخوانی پایه پلیمری". علوم و فناوری کامپوزیت, 2, 2, 1394, 9-16. محمدعلیها, محمدرضا, موسوی, عاطفه, مهری خوانساری, نبی, صفرآبادی, مجید. (1394). 'بررسی تاثیر نانوذرات هیدروکسی آپاتیت و آلومینا بر رفتار چقرمگی شکست کامپوزیت‌های دندانی و استخوانی پایه پلیمری', علوم و فناوری کامپوزیت, 2(2), pp. 9-16. محمدعلیها, محمدرضا, موسوی, عاطفه, مهری خوانساری, نبی, صفرآبادی, مجید. بررسی تاثیر نانوذرات هیدروکسی آپاتیت و آلومینا بر رفتار چقرمگی شکست کامپوزیت‌های دندانی و استخوانی پایه پلیمری. علوم و فناوری کامپوزیت, 1394; 2(2): 9-16. استفاده از کامپوزیت‌های دندانی و استخوانی پایه پلیمری از جنس پلی متیل متا اکریلات به سبب سازگاری مناسب بیولوژیکی با بدن و استحکام نسبتا خوب، وزن کم و قیمت پایین در کاربردهای بیومکانیکی و پزشکی به‌ عنوان پروتز و یا برای جایگزینی و ترمیم استخوان ها و دندان‌های آسیب دیده کاربرد فراوانی یافته است. یکی از نقاط ضعف این مواد، چقرمگی شکست نسبتا کم و مقاومت پایین در برابر رشد ترک در مقایسه با ماده دندانی و استخوانی می‌باشد که این امر می‌تواند نهایتا منجر به بروز و رشد ترک از محل فصل مشترک کامپوزیت – دندان و یا از داخل ماده کامپوزیت دندانی و پروتزهای جایگزین یا ترمیمی دندانی - استخوانی شود. استفاده از نانو موادی نظیر هیدروکسی آپاتیت و آلومینا برای مقاوم سازی این کامپوزیت‌های دندانی– استخوانی گزینه مناسبی می‌باشد. در این پژوهش، اثر افزودن درصدهای مختلفی از نانو ذرات هیدرواکسی آپاتیت و آلومینا بر مقدار چقرمگی شکست (مود I) ماده کامپوزیت پروتز دندانی پایه پلیمری پلی متیل متا اکریلات (PMMA) با انجام آزمایش‌های شکست مورد بررسی قرار می‌گیرد. نشان داده می‌شود که چقرمگی شکست ماده PMMA، با افزودن نانوذرات فوق تا حدودی باعث بهبود مقاومت در برابر رشد ترک می‌شود. البته اثر نانو ذرات آلومینا در افزایش چقرمگی شکستPMMA از هیدروکسی آپاتیت بیشتر می‌باشد. بیشترین افزایش چقرمگی شکست مربوط به ماده کامپوزیت دندانی حاوی 10 درصد هیدروکسی آپاتیت و 6 درصد آلومینا است. Polymethylmethacrylate (PMMA) based dental and bone composites are used frequently in biomedical applications as implants, bone cements, restorative materials and etc. This is mainly because of some characteristics of PMMA such as biocompatibility, good mechanical properties and its low cost. However, in comparison with bone and dentin, PMMA based dentures or implants have lesser fracture toughness (i.e. smaller crack growth resistance) which makes them very susceptible to brittle and sudden failures. The use of nano additive materials like hydroxyapatite and alumina as filler particles may probably increase the crack growth resistance of such composites. Hence in this research the effects of adding different weight percentages of these two nano particles are examined on mode I fracture toughness of PMMA based denture composites. The experimental fracture toughness results demonstrated that the fracture resistances of manufactured nano-composites are increased in general relative to neat PMMA. The influence of alumina was more pronounced than the use of hydroxyapatite particle. The highest increase in fracture toughness was observed for composite containing 10% hydroxyapatite and 6% alumina. Best, S. M. Porter, A. E. Thian, E. S. and Huang, J., “Bioceramics: Past, Present and For the Future”, Journal of the European Ceramic Society, Vol. 28, No. 7, pp. 1319-1327, 2008. Chen, S. Y. Liang, W. M. and Yen, P. S., “Reinforcement of Acrylic Denture Base Resin By Incorporation of Various Fibers”, Journal of Biomedical Materials Research, Vol. 58, No. 2, pp. 203-208, 2001. Dabbar, U.R. and Huggett, R.H., “A Denture Fracture-Survey”, British Dental Journal, Vol. 176, pp. 342-345, 1994. Vallittu, P. K., “Effect of Some Properties of Metal Strengtheners on the Fracture Resistance of Acrylic Denture Base Material Construction” Journal of Oral Rehabilitation, Vol. 20, No. 3, pp. 241-248, 1993. Fujishima, A., and Ferracane, J. L., “Comparison of Four Modes of Fracture Toughness Testing For Dental Composites” Dental Materials, Vol. 12, No. 1, pp. 38-43, 1996. Elshereksi, N. and Malaysia, U. S., “Effect of Filler Incorporation on the Fracture Toughness Properties of Denture Base Poly (Methyl Methacrylate)” Journal of Physical Science, Vol. 2, No. 2, pp. 1-12, 2009. Hill, E. G. Bates, J. F. Lewis, T. T. and Rees, N., “Fracture Toughness of Acrylic Denture Base” Biomaterials, Vol. 4, No. 2, pp. 112-120, 1983. Bagheri, R. Fani, M. Ghasrodashti, A. B. Yadkouri, N. N. and Mousavi, S. M., “Effect of A Home Bleaching Agent on The Fracture Toughness of Resin Composites, Using Short Rod Design” Journal of Dentistry, Vol. 15, No. 2, pp. 74, 2014. Zhao, D. Botsis, J. and Drummond, J. L., “Fracture Studies of Selected Dental Restorative Composites”, Dental Materials, Vol. 13, No. 3, 198-207, 1997. Drummond, J. L., “Degradation, Fatigue, and Failure of Resin Dental Composite Materials” Journal of Dental Research, Vol. 87, NO. 8, pp. 710-719, 2008. Suemasu, H. Wada, T. Aizawa, M. Gozu, K. Nozue, A. and Itatani, K., “Fracture Toughness and Failure Mechanism of Polymer-Introduced Porous Hap Composites”, In ICF10, Honolulu (USA) 2001. Ellakwa, A. E. Morsy, M. A. and El‐Sheikh, A. M., “Effect of Aluminum Oxide Addition on the Flexural Strength and Thermal Diffusivity of Heat‐Polymerized Acrylic Resin” Journal of Prosthodontics, Vol. 17, No. 6, pp. 439-444, 2008. Mousa, W. F. Kobayashi, M. Shinzato, S. Kamimura, M. Neo, M. Yoshihara, S. and Nakamura, T., Biological and Mechanical Properties of PMMA-Based Bioactive Bone Cements. Biomaterials, Vol. 21, No. 21, pp. 2137-2146, 2000. Khandaker, M. Vaughan, M. B. Morris, T. L. White, J. J. and Meng, Z., “Effect of Additive Particles on Mechanical, Thermal, and Cell Functioning Properties of Poly (Methyl Methacrylate) Cement” International Journal Of Nanomedicine, 9, 2699, 2014. Mobasherpour, I. Hashjin, M. S. Toosi, S. R. and Kamachali, R. D., “Effect of the Addition Zro 2–Al 2 O 3 on Nanocrystalline Hydroxyapatite Bending Strength and Fracture Toughness” Ceramics International, Vol. 35, No. 4, pp. 1569-1574, 2009. Franklin, P. Wood, D. J. and Bubb, N. L., “Reinforcement of Poly (Methyl Methacrylate) Denture Base With Glass Flake” Dental Materials, Vol. 21, No. 4, pp. 365-370, 2005. Al-Haddad, A. Roudsari, R. V. and Satterthwaite, J. D., “Fracture Toughness of Heat Cured Denture Base Acrylic Resin Modified With Chlorhexidine And Fluconazole As Bioactive Compounds”, Journal of Dentistry, Vol. 42, No. 2, pp.180-184, 2014. Ayatollahi, M. R. and Saboori, B., “A new fixture for fracture tests under mixed mode I/III loading|”, European Journal of Mechanics-A/Solids, Vol. 51, pp. 67-76, 2015. Maccagno, T. M. and Knott, J. F., “The fracture behaviour of PMMA in mixed modes I and II” Engineering Fracture Mechanics, Vol. 34, No. 1, 65-86, 1989. Saghafi, H. Zucchelli, A. and Minak, G., “Evaluating fracture behavior of brittle polymeric materials using an IASCB specimen” Polymer Testing, Vol. 32, No. 1, pp. 133-140, 2013. Haghpanahi, M., and Ghomashchi, H., “Cement-implant interface fracture failure by crack initiation due to interface cavity stress concentration” IUST International Journal of Engineering Science, Vol. 19, No. 5, pp. 173-186, 2008. Janssen, D. Mann, K. A. and Verdonschot, N., “Finite element simulation of cement‐bone interface micromechanics: A comparison to experimental results” Journal of Orthopaedic Research, Vol. 27, No. 10, pp. 1312-1318, 2009. Mann, K. A. Ayers, D. C. Werner, F. W. Nicoletta, R. J. and Fortino, M. D., “Tensile strength of the cement-bone interface depends on the amount of bone interdigitated with PMMA cement” Journal of biomechanics, Vol. 30, No. 4, pp. 339-346, 1997. Mann, K. A. Edidin, A. A. Ordway, N. R. and Manley, M. T., “Fracture toughness of CoCr alloy-PMMA cement interface” Journal of biomedical materials research, Vol. 38, No. 3, pp. 211-219, 1997. Tsouknidas, A. Maropoulos, S. Savvakis, S. and Michailidis, N., “FEM assisted evaluation of PMMA and Ti6Al4V as materials for cranioplasty resulting mechanical behaviour and the neurocranial protection” Biomedical Materials and Engineering, Vol. 21, No. 3, pp. 139, 2011. Zhou, J. Wang, Y. and Xia, Y., “Mode-I Fracture Toughness Measurement of PMMA With The Brazilian Disk Test” Journal of Materials Science, Vol. 41, No. 17, pp. 5778-5781, 2006. Ayatollahi, M. R. Aliha, M. R. M, and Hassani, M. M., “Mixed Mode Brittle Fracture In PMMA—An Experimental Study Using SCB Specimens” Materials Science and Engineering: A, Vol. 417, No. 1, pp. 348-356, 2006. Ayatollahi, M. R. and Aliha, M. R. M., “Analysis of A New Specimen For Mixed Mode Fracture Tests on Brittle Materials” Engineering Fracture Mechanics, Vol. 76, No. 11, pp. 1563-1573, 2009. Taylor, D. Merlo, M. Pegley, R. and Cavatorta, M. P., “The effect of stress concentrations on the fracture strength of polymethylmethacrylate” Materials Science and Engineering: A, Vol. 382, No. 1, pp. 288-294, 2004. Safarabadi, M. Khansari, N. and Rezaei, A., “An Experimental Investigation of HA/AL2O3 Nanoparticles on Mechanical Properties of Restoration Materials” Engineering Solid Mechanics, Vol. 2, No. 3, pp.173-182, 2014. Ayatollahi, M. R. Aliha, M. R. M. and Saghafi, H., “An improved semi-circular bend specimen for investigating mixed mode brittle fracture” Engineering Fracture Mechanics, Vol. 78, No. 1, pp. 110-123, 2011. Aliha, M. R. M. and Ayatollahi, M. R., “Geometry effects on fracture behaviour of polymethyl methacrylate” Materials Science and Engineering: A, Vol. 527, No. 3, pp. 526-530, 2010.